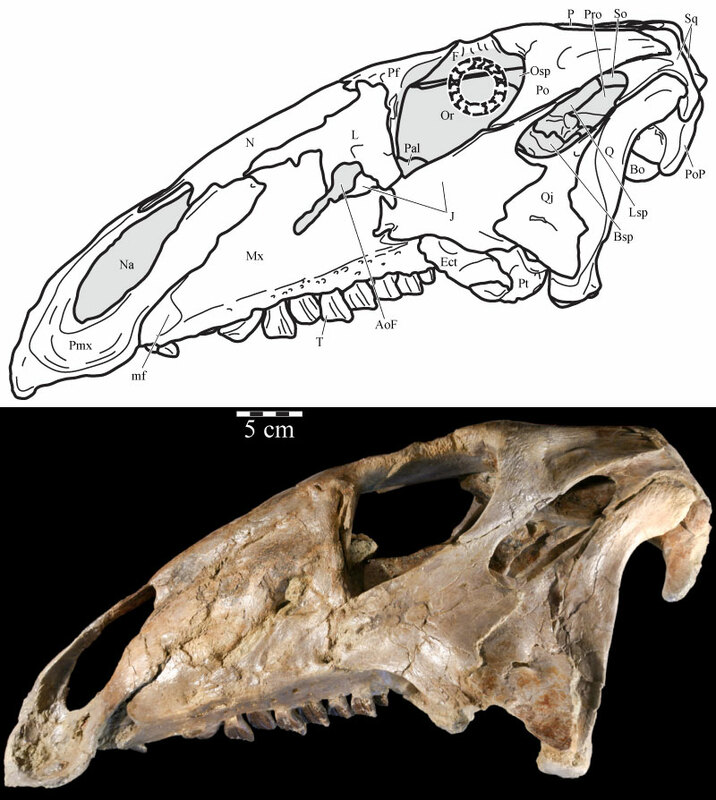 Left lateral skull schematic (above) and left skull photograph (below) of OMNH 58340. The skull is angled at the ‘alert position’ indicated by the horizontal semicircular canal. Natural fenestrae are shaded gray. Dashed outline denotes conjectural sclerotic ring. Anterior is to the left. Abbreviation: mf – maxillary foramen. Thomas (2015: fig. 2). As stinkin’ ornithischians go, Tenontosaurus is near and dear to my heart. For some reason beyond the ken of mortals, the Antlers Formation of southeast Oklahoma has yielded only a small handful of Acrocanthosaurus (Stovall and Langston 1950; Currie and Carpenter 2000), one partial Deinonychus skeleton and a few dozen shed teeth (Brinkman et al. 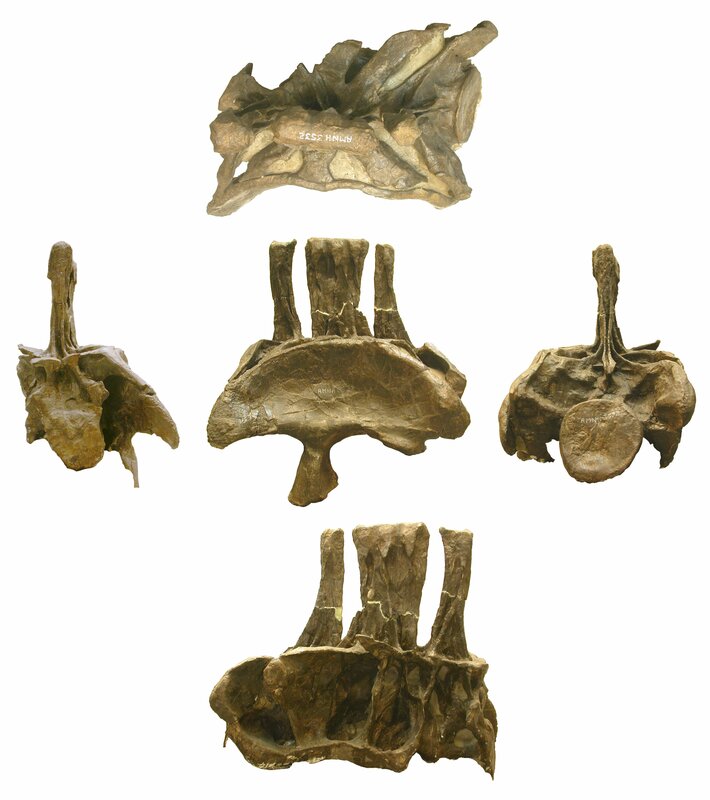 1998), the single, lonely, woefully incomplete holotype specimen of Sauroposeidon (Wedel et al. 2000a, b) – and roughly five flarkjillion skeletons of Tenontosaurus. I know a lot of those skeletons intimately: between 1994 and 2001, I went on about two dozen OMNH digs to pull them out of the ground, and I worked on a couple as a volunteer preparator. 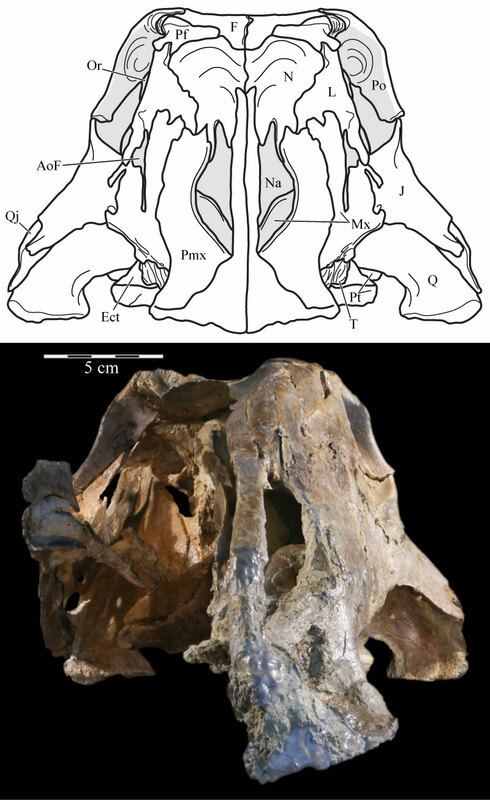 Anterior skull schematic (above) and photograph (below) of OMNH 58340. The two images are set to the same scale, demonstrating the amount of displacement in the right side of the skull. The schematic was reconstructed by digitally mirroring the left side of the rostrum and suspensorium in order to approximate the actual appearance of the skull. Natural fenestrae are shaded gray. Anterior is out of the page. Thomas (2015: fig. 18). I was off to Berkeley in 2001, so I missed the fun when another crew got the best-ever Tonto specimen, OMNH 58340. Except for the back half of the tail, which had eroded away, almost every bit of the skeleton was preserved in perfect articulation, even the hyoid apparatus, terminal phalanges, proatlas, and atlas cervical ribs. The skull was a bit disarticulated – half of the rostrum had floated out of position, and the stapes and palpebrals were missing – but it’s still the nicest Tonto skull ever found, and one of the best-preserved fossils to ever come out of the Antlers Formation. Now that skull has been very thoroughly described by Andrew Thomas. Andrew wrote it up for his MS thesis under my first mentor, Rich Cifelli, and it was published last month in Palaeontologica Electronica (Thomas 2015). I had dinner with Andrew and his family when I visited the OMNH in the spring of 2014, and he showed me a down-scaled translucent 3D print of the left half of OMNH 58340. I learned more about ornithischian skulls playing with that thing over dinner than I had in the previous two decades of (admittedly quarter-assed) study. Medial view of the left side of the virtual skull of OMNH 58340 with the vomer present (10.1), allowing a view of the articulation of the vomer with the pterygoid, and with the palatine and vomer removed (10.2), allowing a view of the joints between the maxilla, lacrimal, prefrontal, jugal, ectopterygoid, and pterygoid. The vertically striated texture present on the visible surfaces of many elements, notably the lacrimal, maxilla, and premaxilla, is an artifact of the process used to isolate CT images of each element from the remainder of the data set. Abbreviations: f – flange; pp – posterior processes; tp – triangular processes. Thomas (2015: fig. 10). So there’s me, playing with a down-scaled 3D print of a Tonto skull. Why am I telling you about this? Because if you want to print your own, you can – digital models of the complete cranium, and all of the individual elements, are available as STL files published along with the paper. Getting to the models takes some doing – they’re in a ZIP file linked from the paper’s Appendix 4, which you can access directly here. Thomas (2015) has a lot more than just cool 3D models – there’s a lot of descriptive goodness, including the cranial endocast, cranial nerves, inner ear labyrinth, and hyoids; a whopping 62 figures, most in full color; and a phylogenetic analysis that incorporates the new morphological data on Tenontosaurus. No revelations there – despite all the nice specimens, Tonto remains an enigma from the murky realm between basal ornithopods and Iguanodontia. But if Oklahoma’s most abundant dinosaur is a bit of a phylogenetic mystery, it’s also becoming a paleobiologic gold mine, thanks in large part to the bone histology studies of Sarah Werning and colleagues (Lee and Werning 2008; Werning 2012 – also see Horner et al. 2009 on histology of Tenontosaurus from the Cloverly Formation of Montana). With the publication of this paper, Andrew Thomas is now part of the “Tenontaissance”. Congratulations, Andrew, and well done! Brinkman, D. L.; Cifelli, R. L.; & Czaplewski , N. J. (1998). First occurrence of Deinonychus antirrhopus (Dinosauria: Theropoda) from the Antlers Formation (Lower Cretaceous: Aptian–Albian) of Oklahoma. Oklahoma Geological Survey Bulletin 146: 1–27. Currie, P. J., & Carpenter, K. (2000). A new specimen of Acrocanthosaurus atokensis (Theropoda, Dinosauria) from the Lower Cretaceous Antlers Formation (Lower Cretaceous, Aptian) of Oklahoma, USA. Geodiversitas, 22(2), 207-246. Horner JR, de Ricqlès A, Padian K, Scheetz RD (2009) Comparative long bone histology and growth of the “hypsilophodontid” dinosaurs Orodromeus makelai, Dryosaurus altus, and Tenontosaurus tilletti (Ornithischia: Euornithopoda). Journal of Vertebrate Paleontology 29: 734–747. Lee, A. H., & Werning, S. (2008). Sexual maturity in growing dinosaurs does not fit reptilian growth models. Proceedings of the National Academy of Sciences, 105(2), 582-587. Stovall, J. W., & Langston, W. (1950). Acrocanthosaurus atokensis, a new genus and species of Lower Cretaceous Theropoda from Oklahoma. American Midland Naturalist, 43(3), 696-728. Thomas, D. Andrew. 2015. The cranial anatomy of Tenontosaurus tilletti Ostrom, 1970 (Dinosauria, Ornithopoda). Palaeontologia Electronica 18.2.37A: 1-99. Wedel, M.J., Cifelli, R.L., and Sanders, R.K. 2000a. Sauroposeidon proteles, a new sauropod from the Early Cretaceous of Oklahoma. Journal of Vertebrate Paleontology 20: 109-114. This is AMNH 3532, a diplodocid sacrum with the left ilium coalesced and the right ilium helpfully missing, so we can see the structure of the sacral ribs. Top row: dorsal view, with anterior to the left; middle row, left to right: anterior, left lateral and posterior views; bottom row: right lateral view. As a matter of fact, we’ve seen this sacrum before, too, in a photo from Matt’s much earlier AMNH visit. But only from a left dorsolateral perspective. Hatcher (1901: fig. 9). 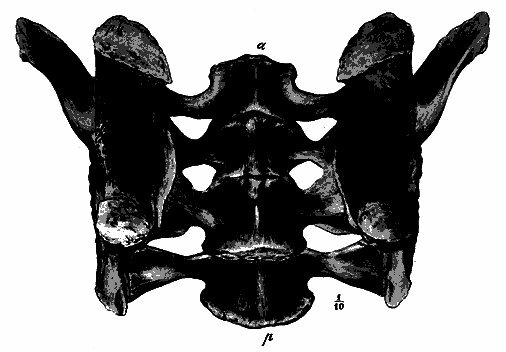 Inferior view of sacrum and ilia of Diplodocus carnegii (No. 94), one tenth natural size; pp, public peduncle; is, ischiadic peduncle; a, anterior end; p, posterior end. That is a much wider sacrum than I’d expected from Diplodocus. So what is going on here? Is Diplodocus a fatter-assed beast than I’d realised? I am guessing not, since my expectation of narrowness has been built up across years of looking at (if not necessarily paying much attention to) Diplodocus sacra. 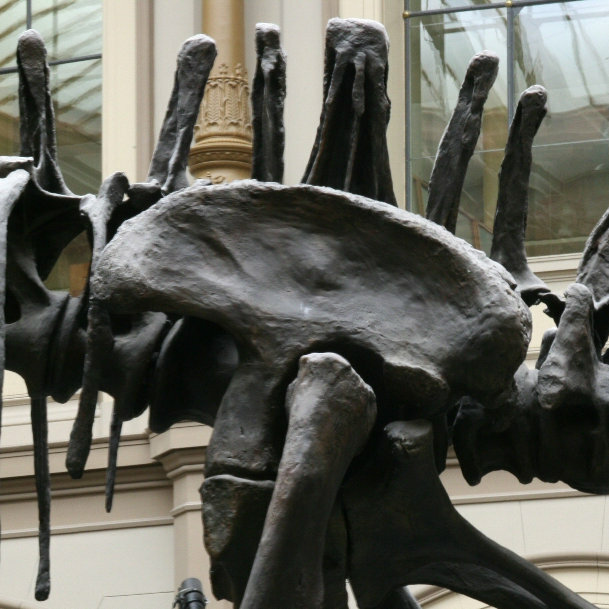 So could it be that CM 94, the referred specimen that Hatcher used to make up some of the missing parts of the CM 84 mount, is not Diplodocus? Well. That is certainly now how I expected to finish this post. Funny how blogging leads you down unexpected paths. It’s a big part of why I recommend blogging to pretty much everyone. It forces you to think down pathways that you wouldn’t otherwise wander.